Hey folks, Hicks here, I just want to share a few tips I’ve learned over the years of hobbying, building, collecting, switching armies, and driving myself crazy when it comes to getting an army finished. When I first started out, I had no clue what was really going on, I’d never really played a game and I just liked building and painting toy soldiers – it’s something I’ve been doing since the mid 1980’s. Since the hobby was new and GW was new to my area (the closest one was an hour away at that time), there wasn’t much of a hurry to get anything together and painted. I took my time. I built one thing at a time and (tried) to paint it before moving on. It worked and it didn’t. Before I started working for GW, the most I’d ever bought at one time was an Empire army for Warhammer. I had my birthday money, my friend Jason had just gotten me back into the hobby and I really liked the Empire. So I went and bought my army – roughly 4 or 5 boxes of models in addition to the starter set models. About a year later, I started working for GW. I got a nice discount on my stuff. I mean a nice discount. I went a little crazy. I would buy an entire army in one fell swoop. Not like 500 or so points, forget that, my armies had to be 2000 points at the minimum. And I had to have it all, NOW. I had to put it all together, NOW. That was a big part of the problem. There was some pressure to have a completed army for each system. After all, I was a representative of the company, a hobby champion – a "Rock Star to the kids" as someone once put it. The community (the new gamers) looked up to the Staff for inspiration. We all felt obligated to get an army fully done. How could we talk the talk if we didn’t walk the walk? It seemed a bit hypocritical to say “Get your army painted!” when we didn’t have one finished ourselves. And with that in mind, you begin to build, build, build. What happens exactly? Well, you get a 2000+ point army built, you have a hundred plus models in front of you and you look at that sea of plastic and metal and think…Why? I am NEVER going to get this done, and all the enthusiasm and excitement you had goes out the window. Then you think “Hey, you know what, I wanted to do (insert army name here)! I’ll start with the codex/army book and the minimum and go from there. Well, that works for about 2 weeks and then all of a sudden, you have another hundred plus models all built and sitting in front of you. You may get a bit farther this time, but ultimately you never feel like you’re getting anywhere and you start over once again. It never ends unless you take the steps to get it under control. There are three things you can do to help make the process manageable. 1. Overcome the impulse to buy... everything. Start by writing out an army list. This is also your shopping list. Start with your HQ/General and your 2 troop/core choices. The base of any army. Start small, 500 points. Build your army in manageable pieces, If you are especially if you’re eager to get into playing right away, 500 points is a good number to start with, and the number of models won’t be so overwhelming that you get frustrated and feel like you’re not getting anywhere. One of the biggest problems I have is seeing that sea of plastic and metal and thinking about getting the entire thing done. It can be a little disheartening. Building and painting in smaller portions gives you a sense of accomplishment, and you can see the results. You see that 500 points of bare models dwindle, and before you know it, you have a part of your army finished. Unless you are trying to get that last unit painted for a tournament tomorrow, don’t rush it. Set reasonable deadlines for yourself, or you run the risk of not getting it done or worse, losing interest. Take time to play a game or two with those 500 points. 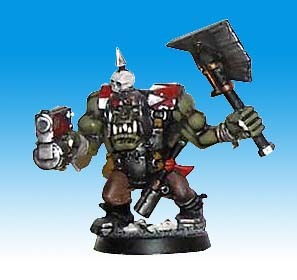 I went to the local store yesterday and played a couple of games with friend Jason using my Orks – both at 500 points, and what that did was get me excited to paint the rest of my Orks that I had on the table. I even picked up a new Trukk and while I REALLLY wanted to put together, I decided to wait and slow down. When it comes to working on your army, finish 1 troop squad first – from opening the package to the final touches and then reward yourself by painting the general. Don’t even open any other package until that particular unit is DONE. If you follow these simple steps, it will be worth it. 500 points is a good starting point, and from there you can add a unit, vehicle, or some other cool addition slowly and won’t end up feeling overwhelmed and discouraged by a sea of naked models (which won’t be the Victoria’s Secret kind). Write out a list beforehand and stick to those models. Of course, we all run into amazing deals every now and then which can’t be passed up, but put those models away unless it’s part of the army you are currently building or you are rewarding yourself for having finished something. Remember, it’s all about making it manageable and seeing results so you don’t get frustrated and quit. I spent HOURS painting a single model. Now I batch paint them and drybrush to get an army done fast. Adam: True, but I've found that by coming up with "formulas" or shortcuts for things, I can still paint fast and maintain a higher standard in the end. It's a good point though, how much QUALITY are you willing to trade for SPEED. I've found the best way for my marines (my own chapter using an adeptus battlegrey base with thraka green wash for a sea-green-grey effect, plus gold details) is to do the initial foundation and base colours for the whole model, then wash it, then do any particularly glaring details such as the eyes and skulls. At this point, if it's a rank and file man, it looks good enough to base, icon and head to the table. If it's a character or an elite unit, I'll go on to do the armour edge highlights and other special detail. Later on if I feel like it, I can do the same to the rank and file that get used the most. After I open the box, if plastic I put them in the bath and soak them for 5 mins in hot water, then put them in a towel over night. Good article. 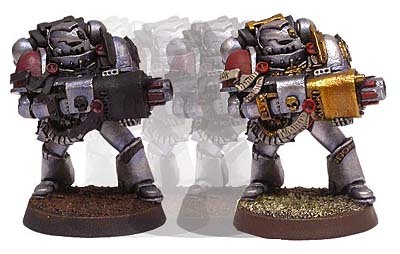 Any tips for us vets who already have 10k+ to paint? I didn't think about it, but I should have included a pic of my staging area where I keep the models that I'm going to be working on. This lets me work on projects in smaller batches that are more manageable. Excellent article. I definitely relate - I love building and kitbashing and primering models and then I'm left with a sea of unpainted stuff lurking on my shelves for months (or years). I'll echo Matt Ragan, my main army (guard) is 8-10k points and it's overwhelming and disheartening to see all at once. I've boxed up nearly everything that I'm not planning on working on right away and it's helped me stay focused and not despair at the mountain of plastic and metal. Working on small bite-sized pieces of the army is definitely the way to go for me. I have also started using a painting chart (http://www.cold-moon.com/40k/Miniatures/Mortant7th/TOEMP10/M7012410.gif) to map out what's done and what needs to be done, and that's helped me stay on track as well. It doesn't look like such a huge job on paper as it does spread out all over my hobby area! ChimeraHiveMind, I'd think the solution is the same ^.~ Divide the army (armies) into smaller chunks (500 to 750 points) and 'hide away' all but a few of them. Then focus on each small chunk in turn. For me I've found that the reward part is assembly and/or painting of a model for an army that I'm not working on, (incidentally it ends up being a model for a friend's army more often then not,) as it's a complete change of pace. The story of my life...good article. I've always referred to this phenomena as 'model shock'. I've done it to myself before, it's awful. The 'make a list and stick to it' is a great approach. Start small and add on, but don't add anything until what you've bought is painted. I started the hobby with one set. 10 Chaos Marines. I painted them and then bought another and painted them. Then...somewhere along the way, I have about 50+ unpainted models, some of them in their original packaging. I miss the simple days. I definitely don't feel pressure to rush, even so, and I do my best. Sometimes, I get bored though and just feel happy with what I have painted. This atricle hits a lot of points home for me and I think I've got to try out some these methods to get back on track and get my dam DA finished. Last year I was working on my salamanders and I was focused on painting the troops. When it came time for ard boyz I had most of the troops painted but the vehicles where not, and since most of the guys were in them it didn't look very impressive. Now that I am working on my chaos I started out painting the vehicles and demon princes and it looks pretty good until my guys get out of their rhinos. Sounds like we had a very similar start. When you were at GW did they have the box o' lead deal for staff going? That was awesome, had to be a 90% plus discount. :) Learned a lot about painting too. Course that was 20 years ago. Forgot a lot about painting too.